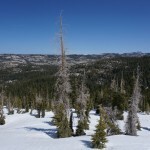 Though it is neither tall nor steep, Mokelumne (“mocha-LOOM-nay”? “muh-KEH-lum-ee”, like Tuolomne?) 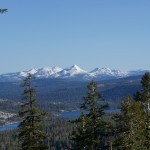 is one of the tougher northern Sierra peaks thanks to its remoteness. 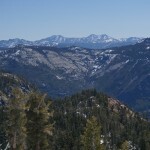 The deep Mokelumne River valley blocks access from Ebbetts Pass to the south, so the easiest access is from Highway 88 to the north. This requires 8-ish miles of hiking through the woods. Despite this, it sees a fair amount of summer traffic thanks to a nearby Boy Scout ranch. 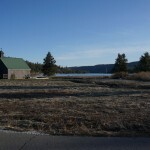 I started from the highway at sunrise, hiking a mile of road to and through Plesse, a seasonal community consisting of some ostentatious houses, a hotel, a campground, and a church. 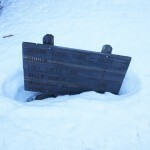 Reaching the trailhead, I continued through the woods, following bits of trail on the bare ground, and snowmobile tracks elsewhere. 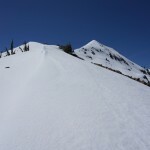 Reaching a clearing, I found myself faced with a steep, black headwall to the south, where I knew I had to go. Losing the trail on the north-facing slope, I headed up randomly until I reached the short cliffs. These are made of apparently-solid conglomerate rock — almost like the wall of a rock gym — and I was tempted to just head up a vertical section, but instead chopped steps in a steep chute. 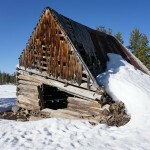 Regaining the trail, I descended to an abandoned house on a meadow, then headed southeast into the next valley. 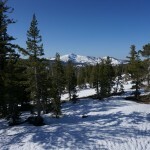 There are trails to follow in the summer, but this section had not melted out enough yet to find them. At the ridge, I finally saw the peak for the first time, and it still looked depressingly far away. I tried to pick an efficient line along the east side of the valley, but it was a mess of gently rolling, wooded terrain covered in undulating snow. 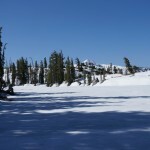 Somewhere during this slog, I found a small, mostly-frozen lake with a couple of ducks. 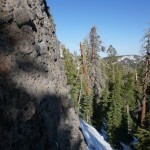 I easily kicked steps up Mokelumne’s north ridge, preferring the exposed rocks where it narrows. Things got a bit sketchy near the summit, where the ridge was completely covered with harder snow, but I made it without having to put on crampons. 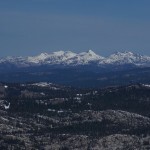 To the southeast, across the impressively deep Mokelumne valley, I saw Highland and Silver; to the northeast, Round Top and Carson Pass; and to the north, Pyramid and the Desolation Wilderness peaks in the distance. It being a warm day, getting back was a long slog through an inch-deep slurpee. With no obvious landmarks to aim for, and trees blocking the view most of the time, I just tried to head roughly up-valley and north, eventually picking up enough familiar landmarks to return to the car. 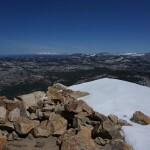 This might be a good trail-run in the summer, but it’s kind of a slog with snow.